Different batteries have different characteristics when it comes to charging; this goes for the various Tesla battery models too. Through the ABRP data collection by generous users, we have quite a lot of real-world data to base our models for use in the route planning, and in this post we give you some insight into the data. 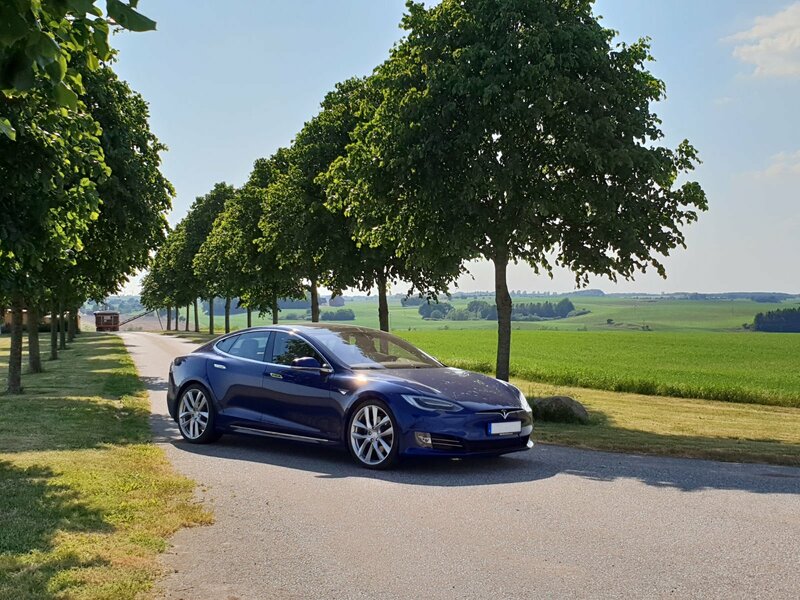 The data here is based on 4600 Supercharging sessions from 801 Tesla Vehicles! First out is the Model 3 Long Range battery. There is a limited amount of data in ABRP’s database – only 38 charging sessions from 13 cars – so please contribute! 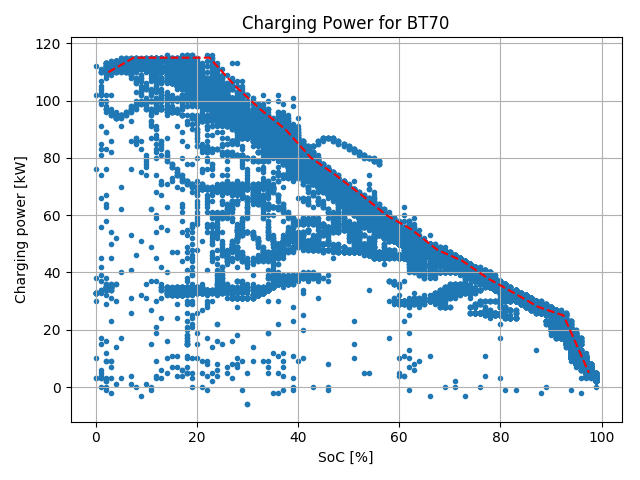 The blue dots are measured data points and the red dashed line is the present ABRP charging power model. Second, the classic S85 battery, which is known for not really being 85 kWh. There is plenty of data here, and as you can see it is charging at very high speed all the way from 0% SoC, but tapers off relatively early. The estimated battery capacity from the contributing cars is 73.4 kWh. That’s why I wrote “85”. It has basically the same capacity as an S/X75. The older S70(d) battery is similar to the BT85, but smaller. From data, the estimated usable capacity is 65.7 kWh. 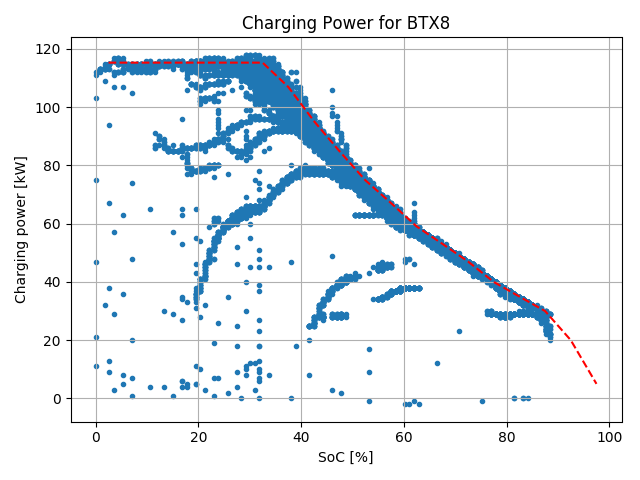 The S/X90 battery, is like the “85 kWh” battery also not really living up to its name. The estimated capacity from the data is 79.8 kWh. It differs from the BT85 in that it charges slower at really low SoC (below 10%) but it compensates by charging a lot faster at higher SoC. 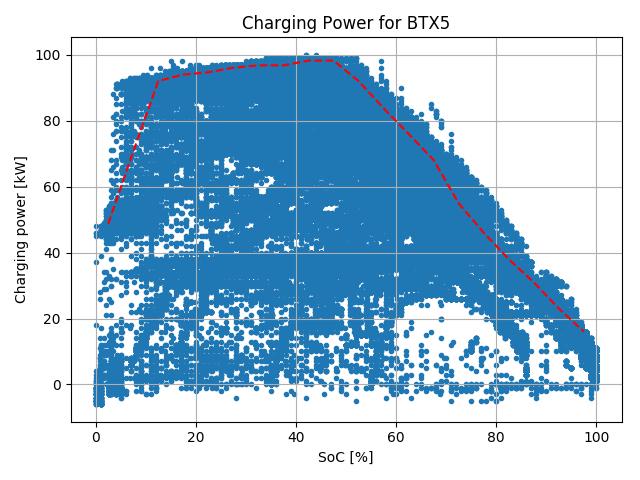 Charging at BTX4 battery from 10 kWh to 50 kWh takes 23 minutes. 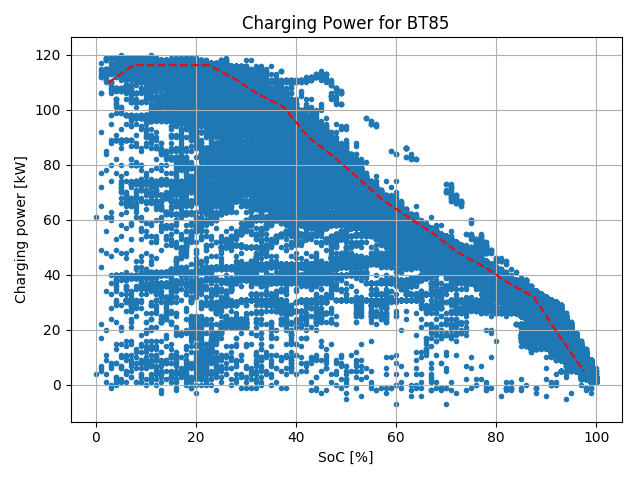 The same charge (in absolute energy, not %) takes 27 minutes in a BT85. 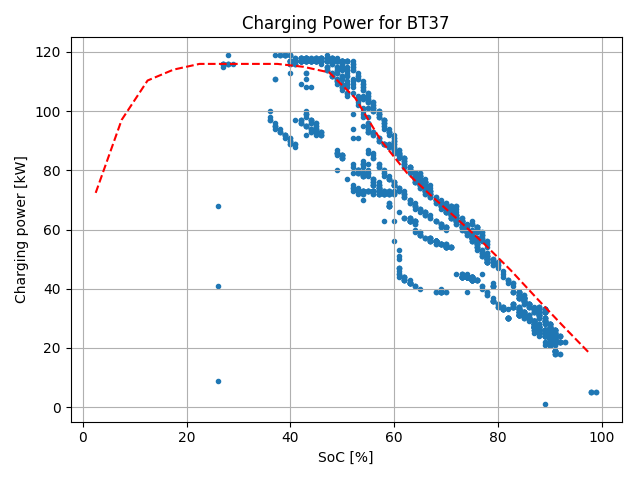 The “new” 75 kWh battery, sometimes software limited to 60 kWh in a S/X60 has an estimated capacity of 71.6 kWh. 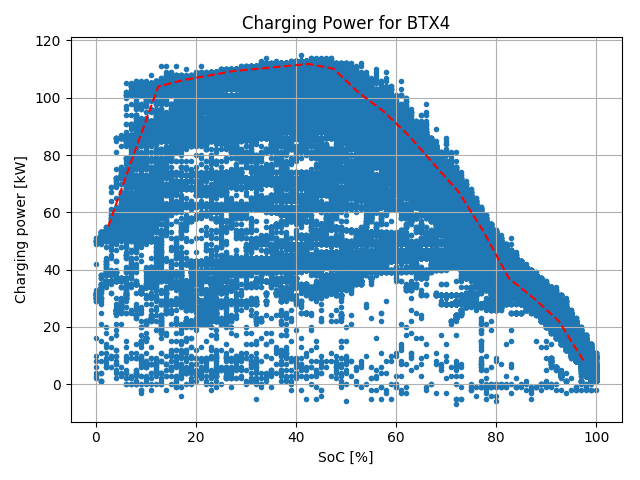 The charging curve is similar to the BTX4 and BTX6 batteries, but in absolute power lower due to the smaller capacity. Charging from 10 kWh to 50 kWh takes 27 minutes. There are a couple of odd Model S and X 75 with an 85 kWh battery, software limited. It is rumored that they have been fitted with left over BT85 batteries, but the charging curves do not look exactly the same. Anyhow, the result is a battery pack with a lot of extra margin and really fast charging. Lucky owners – 14 of them contribute data to ABRP! thank you for showing your charging data. Great work with ABRP!! 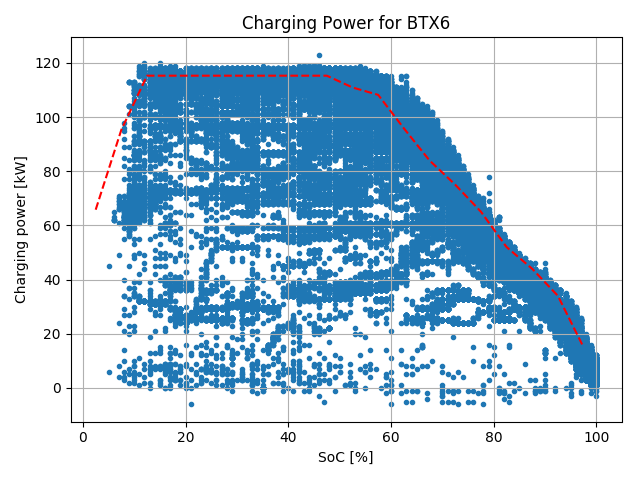 I am one of the happy owner of a MS75D with a BTX8 battery :-) Some comments regarding your data: BTX8 is a SW-limited 85kWh/BT85 battery, so to "emulate" a BTX5 battery it should be limited to 71.6 kWh, which is 71.6/73.4 = 97.5%. 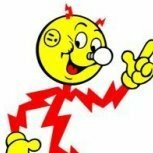 So 97.5% SoC should be the charging limit, where the charging power drops to zero. Instead in your graph above the charging limit is something around 88%, so charging would stop at 88% of 73.4kWh = 64 kWh. Could you please help me, am I wrong? It would be interesting to add the battery temperature parameter to the data. Up here in Canada, it affects by a lot the charging speed. Maybe the dots could be color-coded associated to a temperature scale. Thanks for that great data and please let us know how we can participate to further data collection. I would give you some out of my mid-range Model 3. I will be honored if you can put this link in your resource page! It's been said that the car battery is the backbone of the car. It is very difficult to maintain the service of car battery. It requires service of car battery time to time. We have also a website which give best and affordable car battery &nbsp;services. For more information, visit our website.